Not only is this smoothie a fresh way to start the day, but it’s also ideal post-gym. 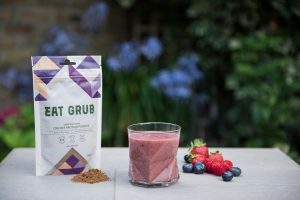 The cricket powder (also known as cricket flour) contains all nine essential amino acids and is particularly high in leucine and isoleucine, which are the key amino acids for aiding muscle recovery. 1 – Blend all the ingredients together until it is smooth. 2 – Enjoy it chilled in a glass, or on-the-go.